The EER program has offered the Master of Science in Energy and Earth Resources since December 2013 to eligible candidates. The Master of Arts in Energy and Earth Resources (EER) and the Master of Science in Energy and Earth Resources (EER) requires 30 hours of graduate course credit of which 6 hours are thesis. Three hours of upper division undergraduate course work may be counted toward the 24 hour course requirement with the approval of the Graduate Advisor. Students entering the program without a geology course that includes the origin and distribution of energy, mineral, and water resources will be required to take a geology course, GEO 386R/EER 396 Geology of Earth Resources. This course should be taken during the first semester of the program. Please note that if your undergraduate degree is focused on any of the core course subjects, you are required to take a higher level course in that core subject. For example, if your undergraduate degree is in Operations Research, you would have to take an Operations Research course that is above the level of Decision Analysis I and II. 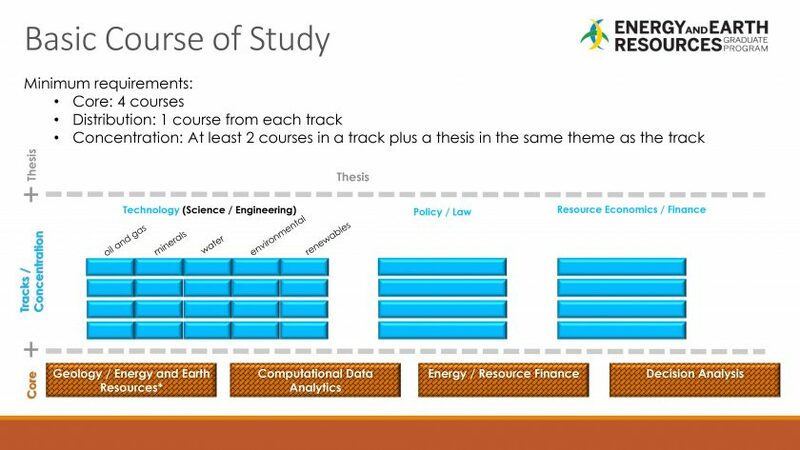 Students will be required to take at least one course in each track and at least two (preferably three) courses in a single track to develop a concentration. The thesis (see below) is designed to supplement the coursework in the concentration. Each EER student is required to take Thesis A and Thesis B to provide 6 credit hours of thesis. Thesis A must be taken before Thesis B and is normally taken in the third full semester in the EER program. Before approval is given by the Graduate Advisor to take Thesis A, the student must have identified his/her thesis supervisor and readers and have reported this to the Graduate Advisor and the Graduate Coordinator at a specified date before the end of the second semester of the program. Potential thesis supervisors include members of the EER Graduate Studies Committee listed under EER faculty. Other appropriate members of the university research community may serve as readers or co-supervisors of EER thesis research with an EER GSC member. An outside (non-UT) reader is feasible, but must be approved by the program and meet guidelines. Prepare research / thesis proposal and identify supervisor and at least two (2) readers for a total committee of three (3) members before the end of the first week of April of the second semester. Must be approved by Graduate Adviser. Thesis A: Gather and analyze data. Thesis B: Synthesize results, draw conclusions and write the thesis. Submit for Committee review no later than April 1. Students can begin thesis work earlier than the third semester if they have selected a supervisor, topic, and readers.